Our Arctic Cat ATV Guide covers the machines made by this small Minnesota manufacturer. Small in size that is - certainly not in ambition or model range! They lead both the ATV and UTV classes in engine size with the 951 cc Thundercat 1000 ATV and the Prowler 1000 UTV. That same small size gives them the ability to react quicker when customers want a new kind of machine. Since they're based in the US, they have a better understanding of what's going on here. Arctic Cat has a full line of two-up ATVs. The new 700 MudPro is a great example. The first "built for mudding" ATV to be offered by a major factory. The 150cc youth model is the first in the new 14 year old age category. 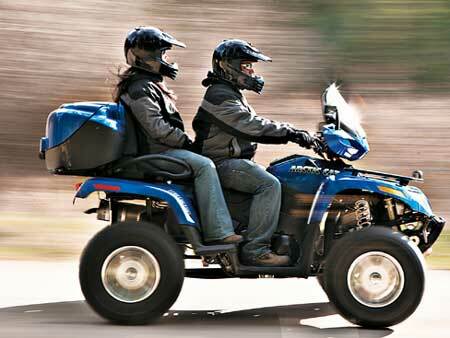 It gives riders between 14 and 16 a way to move up to more power and speed gradually - all on the same ATV. Along with the ATV models we'll tell you about the most popular accessories and where to get great deals on them. And when it's time for repairs or maintenance - we'll help you find the best deals on parts, repair manuals, and more. Being a smaller player has its downsides too. It's no secret that Arctic Cat has had problems with quality and reliability. Those seem to be improving, but when we hear about recalls and other issues, you'll know about them too. No sugar coating here! Arctic Cat Mud Pro 700. Full review of the original factory mud ATV. Arctic Cat Wildcat. Complete review of the exciting new side by side ROV (Recreational Offroad Vehicle). This Arctic Cat breaks new ground in the sport UTV class. 2009 Arctic Cat ATV Prices. Our quick reference guide of 2009 Arctic Cat prices lists all the models for 2009. Arctic Cat is doing everything they can to help get you on an ATV. Check out the special offers! Arctic Cat Parts. ATV parts at bargain prices for all Arctic Cat models. Our customized links are constantly updated to always show the best deals available. Arctic Cat CV Joints. Learn what your options are when you need to replace those ATV CV joints. Complete with tips on finding the best deals. Arctic Cat Oil Change Kit. Prices for these oil change kits are all over the place. Find out how and where to find the best values.